Spiritual tours to India are a very unique and wonderful opportunity to open up a completely different world from the mainstream tourist visits. 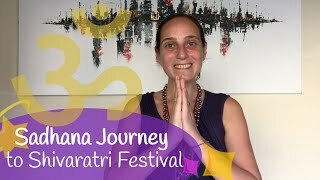 Bharati will lead you through this 12-day journey passing along her longtime spiritual knowledge, offering new perspectives, and creating the setting for a transformation of the soul. It really is both an inner and outer journey of discovery! You will experience together power places full of vigorous energy, extraordinary encounters with the wisest sages, siddhas and yogis while receiving the highest spiritual wisdom where everything imaginable is possible. During this trip, you’ll immerse yourself into a world of rituals and mantras allowing you to regain knowledge of yourself and set in motion for you soul changes. The fourteenth day of every lunar month, or the day before the new moon, is known as Shivratri. Among the twelve Shivratri that occur in a calendar year, the one that occurs in the month of February or March holds the most spiritual significance, which is why it is called Maha Shivaratri. Shiva is the very energy on which the entire creation rests. This energy pervades the entire universe and is present in every living being. This energy is referred to as Shiva Tattva and during Shivaratri this energy, or our aura, descends and touches the material ground. It is the time for our inner consciousness to come alive within our body. Traditions during this festival are performing poojas, meditating and reciting mantras. These sacred practices bestow a sense of peace and oneness within us and with the world. Meditation gives access to something beyond the scope of the mind and intellect, into a higher consciousness. Surrendering to this consciousness is having faith that there is a divine power that is taking care of us. Meditation and surrender bring peace and solace to us. Shivaratri is taking refuge in Shiva, or in other words it is about celebrating and understanding the energy, or Shiva Tattva, within oneself. All longing to know the unbounded, all longing to know the oneness in the Existence is yoga. The word “yogi” means one who has realized the oneness of the Existence. Shivaratri offers a person, or a yogi, an opportunity to experience this. It is an opportunity for you to dissolve your limitedness and to experience the unboundedness of the Source of creation. Shivaratri is a festival that honors Lord Shiva. It is believed that worshipping Lord Shiva on this day helps rid one of all the sins. This is also known as the day that Lord Shiva married Goddess Parvati. Ratri means ‘night’ and also ‘take refuge.’ Shivratri is the night we take refuge in our spirit, or Shiva. Lord Shiva is considered the soul of everything. There is no difference between our soul and Lord Shiva. Since Lord Shiva symbolizes truth, peace, beauty, and infinity, He represents the essence of our soul as well. It is what we are made of. When we worship Lord Shiva, we recognize these higher qualities within ourselves. So this is a time to celebrate the soul or consciousness within where we take refuge in the Divine Consciousness. As the holy mountain of Arunachala in Tiruvannamalai holds the energies of Shiva, this place is one of the most powerful in all of India to celebrate Shivaratri. On this night, the northern hemisphere of the planet is positioned in such a way that there is a natural upsurge of energy in a human being. As a result, it is a day when nature is pushing you towards your spiritual peak. To reach this peak, there is a tradition during Shivaratri where you remain with your spine vertical all night, you stay awake. This allows the natural upsurge of energies to find their way within you. It’s important to stay open and receptive for emerging soul energies and spontaneous changes of the schedule during this trip. The most beautiful experiences happen not by plan but by divine grace. And we should freely open ourselves up to them safely here. If we accept it, we often experience very surprising divine encounters. So please be open and flexible when joining this journey. The Divine always acts beyond the mind – on the level of the soul and the heart. Tiruvannamalai is a little town at the foot of the holy mountain Arunachala, which is considered to be a manifestation of Shiva. Many Indians from the North travel South to visit Arunachala, because it is considered to be pure Shiva energy. This town was also the home for Sri Ramana Maharshi. He revealed the direct path of practice of Self-enquiry and awakened mankind to the immense spiritual power of the holy Arunachala Hill, the spiritual heart of the world. Our Ashram is located in Tiruvannamalai near the Arunachala. Many people come here every day (and especially at the time of a full moon), on a pilgrimage to walk around the Arunachala; this act is known as Pradakshina. From Tiruvannamalai, we will travel to powerful places where special encounters with extraordinary Yogis are possible. One such Yogi is Ayya, who spent eleven years living in a cave, neither eating nor speaking. He will lead us to secret places full of spiritual vibrations that are not usually seen by tourists, or even many locals. It will be an unforgettable experience!